Sakya is one of the four main traditions of Tibetan Buddhism. The Sakya tradition takes its name from the monastery founded in 1073 at Sakya (‘the place of grey earth’) in south-western Tibet by Konchog Gyalpo, a member of the Khon clan. 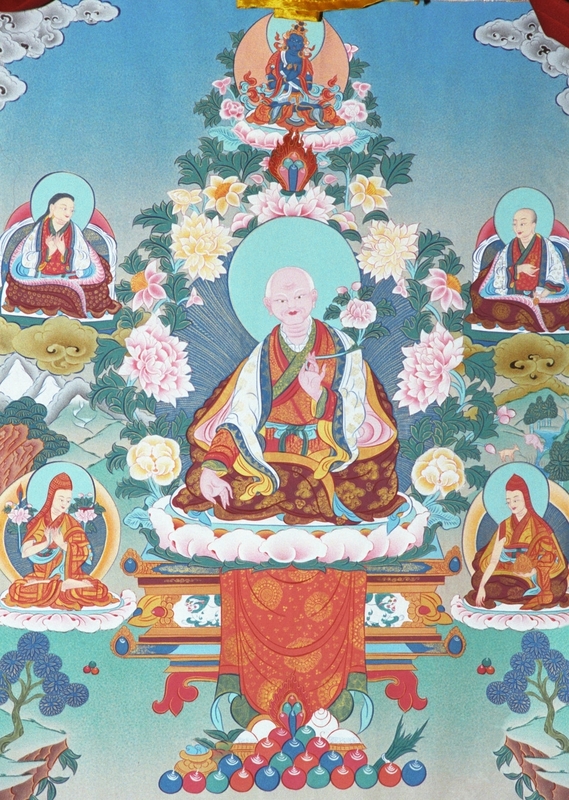 This influential family had been practising the Nyingma (old) school during that time. But with the introduction of new Tantra to Tibet in the eleventh century, Konchog Gyalpo studied the theories and methods and founded the Sakya tradition. The most important of the teachings which he received from his teacher Drogmi Lotsawa, a disciple of the Indian scholar Gayadhara, was the meditational system known as the Path and Its Fruit (Lamdre). In the twelfth and thirteenth centuries, the Sakya tradition rose to a position of prominence in the religious and cultural life of Tibet. This was due largely to the endeavours of the five great masters: Sachen Kunga Nyingpo (1092-1158); Sonam Tsemo (1142-1182); Drakpa Gyaltsen (1147-1216); Sakya Pandita (1182-1251); and Chogyal Phakpa (1235-1280). Since that time the tradition and its two principal subsets, the Ngor subset founded by Ngorchen Kunga Sangpo (1382-1457) and the Tsar subset founded by Tsarchen Losal Gyamtso (1502-1556) and subsequently the Dzongpa subset founded by Dorje Denpa Kunga Namgyal (1432-1496) have been adorned by the labours and spiritual blessings of numerous illustrious yogis and scholars. Now the Sakya tradition under the compassionate guidance of His Holiness the Sakya Trizin (b. 1945), magnificent incarnation of the Khon line, is planting its roots outside Tibet in India. His Holiness the 41st Sakya Trizin left Tibet in 1959 after the political upheaval. In exile, His Holiness met all the religious leaders in 1963 including His Holiness the 14th Dalai Lama and took permission to set up a monastery to preserve the Sakya tradition and heritage of Tibetan religion and culture. Thus He created Sakya Centre which is located in Rajpur, Dehradun in India. Thereafter Sakya Institute was created at Puruwala to impart higher education in Buddhist philosophy. At Puruwala, a Tibetan settlement was also established for the people of Sakya. Sakya Centre is regarded as the main monastery of His Holiness Sakya Trizin and the Sakya Lineage outside Tibet.